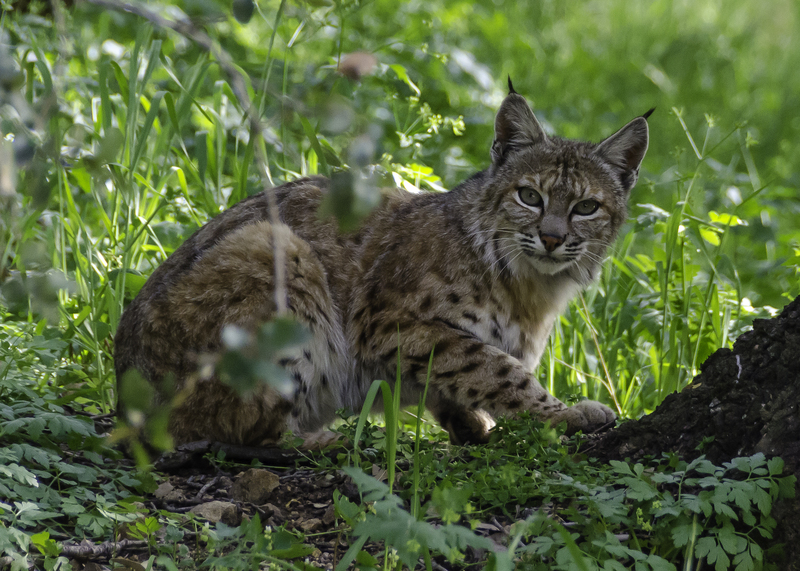 Find out a little more about the new issue of Methods in Ecology and Evolution (including details about the bobcat on this month’s cover) below. This issue contains two Applications articles and one Practical Tools article. These papers are freely available to everyone, no subscription required. An EMU deployed in the field. Environmental Microcontroller Units: With the growing availability of inexpensive microcontrollers and hobbyist electronics, the time is ripe to tap into the versatility and computational power of do‐it‐yourself electronics to address critical ecological questions. And Mickley et al. are here to help! They introduce environmental microcontroller units (EMUs): data loggers designed and built to accurately measure fine‐scale variation in temperature, humidity, light, and soil moisture at low cost. This Practical Tools paper is also one of our Featured Articles this month. Machine Learning and Camera Traps: Camera trap studies tend to produce a lot of images – often upwards of a million. It takes a huge amount of time to manually analyse all of those pictures to get the important data from them. Luckily, you don’t have to any more. Tabak et al. trained machine learning models to automatically classify wildlife species from camera trap images. This Applications paper is the article that the cover image comes from. Animal Patterns: PAT-GEOM is a free software package from Chan et al. allows users to measure seven properties of an animal pattern. It can be employed in a wide range of studies on topics such as aposematism, camouflage and mimicry, and also has the potential to be applied to other research fields such as landscape ecology, botany and cellular biology. An INLA Approach for Isoscapes: The integrated nested Laplace approximation (INLA) technique provides a promising tool for generating isoscape models and associated uncertainty surfaces where reference data are accompanied by multiple, quantifiable sources of uncertainty. Compared to alternative isoscape prediction methods, it shows high spatial precision and reduced variance. Low‐Coverage Whole‐Genome Sequencing: Zhang et al. present a novel whole‐genome sequencing‐based pipeline for extracting essential phylogenomic markers through rapid de novo genome assembling from low‐coverage genome data. Their method uses a series of computationally efficient bioinformatic tools. Simulated species, generated to exhibit different levels of prevalence. Area Under the Precision‐Recall Curve: The area under the precision‐recall curve (AUC‐PR) has important advantages for evaluating models of rare species. Sofaer et al. show that AUC‐PR has important advantages for evaluating models of rare species, and its benefits in the context of unbalanced binary responses will make it applicable for other ecological studies too. Testing the Mantel Statistic: To address the issue of spatial autocorrelation in testing the Mantel statistic, Crabot et al. have developed a new procedure based on spatially constrained randomizations using Moran spectral randomization. They have proposed an alternative solution applicable in every field to correctly compute Mantel statistic with a fair type I error rate. Colonization Events and Species Distributions: Singer et al. present the novel “dating‐based approach” that requires one complete survey of species occurrence and estimates of subpopulation ages to back‐date colonization events. This month’s cover shows a bobcat (Lynx rufus) caught in a camera trap in Florida, USA. Camera traps provide researchers with the ability to remotely and non‐invasively observe wildlife over large geographical areas with minimal human involvement. However, studies using this technology accumulate millions of images that need to be analysed to obtain data that can be used in ecological analyses. Tabak et al. used 3.7 million images to train machine learning models that automatically identify 27 species from camera trap images. The trained model is fast (2,000 images per minute on a laptop computer) and accurate (98%) across the 27 species. The ability to rapidly identify millions of images from camera traps can fundamentally change the way ecologists design and implement wildlife studies. To keep up to date with Methods newest content, have a look at our Accepted Articles and Early View articles, which will be showing up in issues later this year. This entry was posted in Journal updates and tagged Animal Patterns, Bayesian Models, camera traps, Ecological Niche Models, Environmental Microcontroller Units, Isoscapes, Machine Learning, Mantel Statistic, phylogenetics, Rare Species, Species Distribution, Whole-Genome Sequencing by Chris Grieves. Bookmark the permalink.